Desh Ke Bhavi Pradhan Mantri Shri Narendra Modi Ke Samne Ek Bahut Mahattvapurna Uttardayitva Hai; Ek Mahan Rashtra Ka Netritva Karna. After a decisive mandate at your disposal; the theatrics at display during the election campaign need to be toned down; and a more responsible leader has to emerge. A news snippet caught my eye; Om Prakash Tiwari in Uttar Pradesh has committed suicide and left a note addressed to you; in a plea to take care of his daughter. The tragi-comic farce displays how millions still believe that a leader can impact individual lives. In the non-stop circus of media-generated trends and television coverage; leaders lives do come under constant scrutiny. Yet; there are still people who naively believe that unreal Mahatmas can alter destiny. As Prime Minister; if you want to be a true “sevak” as you have promised; shirk ostentation instead of lip-service as all leaders before you; attacked in multiple forums. Do the things you have promised with a vengeance; full steam ahead. Nobody grudges you dhokla, khakhra and the Gujarati language; symbols of Bharatiya (Indian) identity. But actions speak louder than words, Modi”ji”; and if you truly want to be the Prime Minister of 1.25 billion Indians, a fifth of humanity; greatness has to ooze through; not just sold cleverly during election time. Admiration for your political prowess is reflected in a thumping victory. The states of U.P and Bihar; traditionally split by caste and bipartisan politics; have also been enamored by the brand of nationalistic inclusive development preached at your dharmakshetra(rallies). J.F.K may have said; ask not what the country can do for you; but what you can do for your country. As citizens of a democratic republic; we value our freedom of expression; but also want real change in our institutions; better infrastructure; world-beating universites; outstanding technical institutions; a strong defence setup and greater respect on the world stage. You have already displayed out-of-the-box thinking; we sorely believe that for India’s sake; there is more to come. With the support of the people; you have unseated a corrupt; self-deprecating and indecisive regime. Please ensure that the “Shehzada” mindset does not become part of your government; and the classical Gujarati play of self-congratulatory domineering “seva” is not inculcated everywhere. 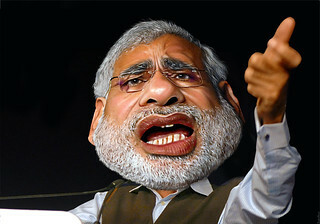 India is a big country; as you may be aware; Modi”ji” and you have seen in your travels. As D.G Vanzara; your jailed police chief may have said; the spirit of noble sacrifice like Guru Gobind Singh‘s Sikhs guided him when acting at your behest. From the Bengali Bauls to Maharashtra’s abhang singers; the country is an experiment in truth; inner and outer. We just don’t want it buried in layers of subterfuge. Running a nation as diverse and complex as India is a formidable task; and we sincerely want you to succeed for our collective sake. The cross-currents of life lead to the fact that things change instantly; memories are short; a hero is vilified the next day. To ensure that your name is remembered decades later; leave a legacy of development and create the greater good.